I have a wonderful two year old boy. He will turn three this Friday, on Halloween. He has big brown eyes, curly brown hair and a wonderful smile. He loves his baby, his big sister (mostly) and his family. He especially loves Choo Choos, balls, bubbles, animals, and swimming in the pool. He also has some special challenges. When you find out that you are pregnant you start imagining your baby. You wonder what they will look like, what kind of person they will be and what the future will hold. Then they are born and if you're lucky, they hand you this chubby little perfect person. Two of the absolute truths that I have learned are there are no guarantees in life and there is no handbook for parenting. Especially if that sweet little person isn't developing "typically". 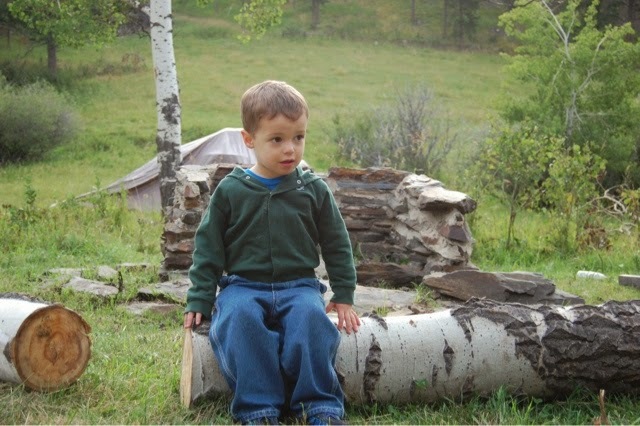 We first began to notice that something was different when he was about 18 months old. At 13 months R3's first word was "all done." We were so happy and felt pretty excited that his first word was in fact, two! Then...nothing. No more words for months. He wasn't even really saying mommy and daddy. With my background, (I have a master's degree in Early Childhood Special Education) I knew something was off. I contacted our local Infant and Toddlers Program for him to be evaluated. He qualified for speech services and we began our journey. We hope, as all parents must who are facing similar situations, that he will grow out of it. We hope that one day he will learn to relate to his peers in a typical way, that he will have words like they do, that I won't constantly feel like everyone is looking at him because he is different. It doesn't help that he is very big for his age. If he were small, people may think that he behaves like a very young two year old, or an emerging two. My sweet boy has a bit of the swede. He is tall and big boned. He will never pass for younger than he is. I see other parents looking at him. I try not to imagine what they are thinking, but I do. Why doesn't he talk? I can hear the questions in my mind. I can see the unintentionally brazen stares at my sweet boy. My same sweet boy who cries when the baby cries, just isn't like the other boys his age. We can't love him more, and love won't fix it. He has come a long way, our sweet boy. He has started preschool and is doing so well! We have words now that are understandable. I can remember lying in bed at night agonizing about what the future holds for him. One day I stopped. I decided to let go of the worry and appreciate him for all of the wonderful things that he is, not what he isn't. That isn't to say that I have all positive moments, because that isn't so. I see videos of boys his age, or younger and it tugs at my heart to hear them talking. I just choose to see (most of the time) his chubby cheeks, his big brown eyes, his curly brown hair. I choose to see him apologize when he accidentally hurts his sisters, or cries when they tell Mulan that she will never bring honor to her family. I choose to see his big, wide mouth grin and his love for all fruit. The fact that he started his potty training by pooping in the potty and saving me from another man poo diaper. I have had to adjust my expectations; learn to love him for the precious child that he is, and try not to stress about his future. It's a daily struggle for me. Thankfully, I have a great village around me. People who are willing to love him for who he is and what he can do. My baby boy is a blessing. In some ways this was my greatest fear, and also my greatest trial as a parent.